This swallow averages 13.5 cm (5 inches) long and weighs about 20g. The bill is tiny. 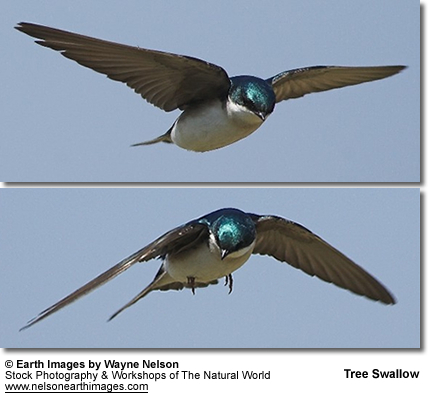 The adult Tree Swallow has iridescent blue-green upperparts, white underparts, and a very slightly forked tail. The female usually has duller colors than the male, often more greenish than the more bluish male. The juvenile plumage is dull grey-brown above and may have hint of a gray breast band. The Tree Swallow nest consists of multiple layers of grasses and thin twigs, and is lined with large feathers from other species. The female lays 4 to 7 white eggs and incubates them by herself. The eggs hatch in about 14 days and the hatchlings are altricial. The hatchlings typically fledge in 16-24 days. While there are young or eggs in the nest, adults frequently dive bomb intruders (including curious humans) and attempt to drive them from the area. Tree Swallows are known to "fight" over feathers in mid-air for reasons which are still under investigation. They subsist primarily on a diet of insects, sometimes supplemented with small quantities of fruit. They are excellent fliers and take off from their perch and acrobatically catch insects in their bills in mid-air.